Category 1 is titled “Do These ‘Solutions’ Really Work?” It includes techniques and concepts that may be valid, but their effectiveness has not been adequately studied and/or important details must be worked out. Category 2 is called “Further Development Needed.” Though these ideas seem to have a sound basis, more work is needed before they can be used by farmers. The ideas mentioned under each category are not fully developed research proposals, but we hope they will lead you to a central question around which to build a research plan. We suggest you start your research with a literature review; such a review might answer your question, or might lead to related questions that you had not thought of at first. If you complete a literature review on one of these topics, please share it with ECHO (Email: echo@echonet.org; write ‘Research Literature Review’ in the subject line), to help keep us informed of current research on various topics. If, after conducting a literature review, you wish to further explore any of these ideas, you are welcome to contact ECHO (Email: echo@echonet.org; write ‘Research Inquiry’ in the subject line). While ECHO is unable to fund or implement external research projects, we are often able to help refine ideas, connect you with others working in similar areas, share your findings with our network, and/or provide small amounts of plant material or seeds. If your research leads to a publication and/or presentation, please acknowledge any role that ECHO had in your accomplishments. Consider a poster presentation of your research at an ECHO conference. For each research topic listed below, we explain what we already know, followed by suggestions for future research. Please let us know if you encounter new information for a given topic. Content is occasionally revised and updated as we become aware of new ideas. Some updates will also be posted on the ECHO Research Blog. ECHO publications referred to below include Asia Notes (AN), ECHO Development Notes (EDN) and Technical Notes (TN). Insect pests can result in substantial losses of stored seed. In West Africa, for example, cowpea bruchids (Callasobruchus maculatus) caused up to 100 percent damage of cowpea seeds stored for a few months (Sallam 1999). Households that produce their own biogas could potentially use some of it to kill insects in stored seeds. In a preliminary trial by ECHO staff in Florida, sawtoothed grain beetles (Oryzaephilus sp.) 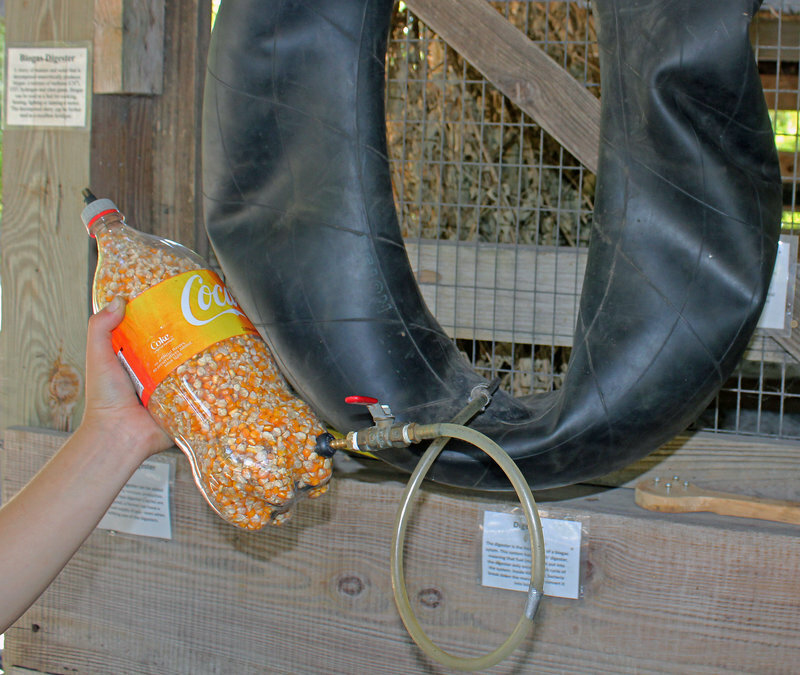 in a 2-L plastic container of maize seed were controlled with biogas from an inner tube (Figure 1). More details on how the container was constructed can be viewed in an ECHO research blog post, available here. Others in the scientific community have looked at this idea (Mohan and Gopalan 1992; Subramanya et al., 1994). Their work could inform future research efforts. How large of a biogas system is needed to generate enough gas to control insects in various-sized containers? This gets at the question of whether or not a household biogas generator can realistically produce enough biogas to satisfy family needs for cooking and lighting, with some left for insect control. What widely available, inexpensive materials could be used to connect a biogas system to a container of seeds, and then seal the container after flushing it with biogas? Without gauges/instrumentation, is there a safe way to determine when all the air in a container of seeds has been replaced with biogas? How long does the biogas need to be sealed in the container to achieve insect mortality? This could be worked out for various species of insect pests. What are some options for scrubbing out H2S? If present in biogas-fumigated containers, does most of the H2S volatilize when the seed container is opened, and what are the implications for human consumption and seed viability? An internet search will yield a range of H2S sensors that could be used in answering these questions. Elevated CO2 levels have been shown to kill insect pests in sealed containers (Navarro 2006). Most insects in stored seeds are killed when the atmosphere in the room or container is comprised of 60% or more CO2. Elevated CO2 levels have little or no adverse effect on the germination of stored seeds (Gupta et al. 2014; Navarro et al. 2012). Most farmers would not have access to CO2 cylinders/tanks, but perhaps they could generate their own CO2 with yeast, sugar and water. Is CO2 generated in this way effective against insects that damage seeds? For resource-poor communities, carbon dioxide (CO2) or biogas can be easily generated at a low cost. 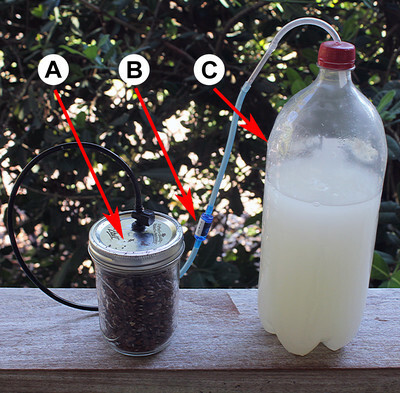 In our experiments, we collected pure CO2 from a yeast-fermented sugar solution [Figure 2]. The CO2 was gently injected into the bottom of the seed-filled vessel through a straw, and because CO2 is heavier than oxygen, it pushed the oxygen out the top of the bottle. Seeds stored for six months in this atmosphere at 24°C have shown no loss of viability compared to the pre-storage germination rate and compared to vacuum-packed controls (packed in laminated foil bags with a commercial vacuum packer). We have tried this method with several species so far with good results, but there is still some doubt as to whether it is safe for all species normally capable of long-term storage (also known as orthodox seeds). Also, with this method, seed must be very dry before flushing with CO2 gas. Use caution and do your own experiments before sharing this technique with farmers. Thompson’s method of replacing oxygen with CO2 is also shown in a video called CO2 Flushing. Tim Motis has also experimented briefly with a CO2 generator to control bruchids in cowpea seeds. See Figure 3 for a photo of the components used. Select a drill bit slightly smaller than the diameter of polyethylene airline tubing. Drill a hole into the lid of a 2-L plastic bottle and push several centimeters of tubing through the hole. With the lid/tubing off, fill the 2-L bottle about two-thirds with warm water. Pour 1 to 2 cups (237 to 473 ml) of sugar into the water and shake the bottle to completely dissolve the sugar; NOTE- the sugar will dissolve faster in warm than in cold water. There should not be any sugar settling to the bottom of the container. Add 1/4 of a teaspoon (1.2 ml) of yeast. Screw the lid (with tubing previously pushed through it) tightly onto the bottle of yeast/water. Note that the end of the airline tubing, inside the bottle, should be well above the level of the water (to prevent liquid from being syphoned into the seed container). Connect the other end of the airline tubing to the lid of a mason jar; some creativity is needed to make a leak-proof connection. Check for leaks. After about 30 minutes, press the sides of the water/yeast container. The bottle should feel firm, indicating a build-up of pressure as CO2 is generated. You will also see some foam produced at the top of the container. Place a few drops of water around the area where the tubing connects to the lid of each container; any bubbles indicate leaks. If necessary, use glue to ensure leak-proof connections. Make a very tiny hole in the lid of the seed jar, for gas to exit as CO2 is generated. To do this, Tim Motis made a hole in the jar lid with a hammer and small nail, covered the nail-hole with tape, and then punctured a portion of tape over the nail hole with a needle. As CO2 is generated, CO2 and/or oxygen will escape through the needle-hole in the tape. Since CO2 is constantly being generated, it builds up in the seed container. 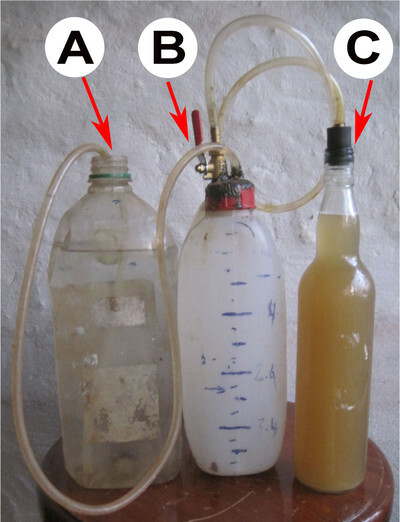 Following the above steps (using 0.5 L [2 cups] of sugar), CO2 was generated for about two weeks, and all cowpea bruchids in the jar were killed. To tell if CO2 is still being produced, place a drop or two of water over the tiny hole in the mason jar lid; if you see bubbles, CO2 is still being generated. What ratios of sugar, water, and yeast will achieve optimum results? Adding more yeast speeds up the production of CO2. Doing so also uses up the sugar faster, reducing the duration of CO2 production. Using less yeast extends the duration, but reduces the rate of CO2 production. Adding more sugar extends the duration of CO2 generation, but only so much sugar can dissolve in a given volume of water (e.g., 0.5 L [2 cups] of sugar is at or near the maximum for 2 L of water). For a given method or recipe, how much time is needed for oxygen to be replaced with CO2 in a container? Is there a simple way to determine when the oxygen has been replaced by CO2? Once the CO2 replaces all or most of the oxygen in a container, can the container be sealed, reducing the time over which CO2 needs to be generated? If so, less sugar would be needed. How long do various species of insects need to be exposed to CO2 to kill larvae, adults and eggs? A literature review will show what insects have been studied already. Dipel is one trade name for a commercial preparation of the bacteria Bacillus thuringiensis, or Bt. Both liquid and powder formulations are available. It is one of the most effective, commonly used natural insecticides. Moth and butterfly larvae that eat as little as one bite of a leaf sprayed with Bt develop a quick acting, fatal intestinal disease (in response to a toxin). Collect a handful of the recently killed caterpillars. Select those that are dead but not dried up, as bacilli may not be alive in dried-up caterpillars. Mash them up and mix them into a pint (473 ml) of lukewarm milk. Leave the mixture alone for three days. Pour the mixture through cheesecloth into a 1-gallon (3.8 L) container. Add water to end up with a full container, and then spray the resulting liquid on to caterpillar-infested plants. Microbiologist, Palmira Ventosilla has worked with a strain of Bt (Bacillus thuringiensis israelensis, abbreviated as Bti) that kills mosquito larvae. Dr. Ventosilla found that Bti can be incubated inside coconuts. Coconuts containing Bti were then broken open over bodies of water to control mosquito larvae. Subsequent work showed that Bti can also be cultured with tea made from boiled yucca plants. Ventosilla’s work in these areas is described in articles available through the International Development Research Centre Digital Library (search for the name ‘Ventosilla’). 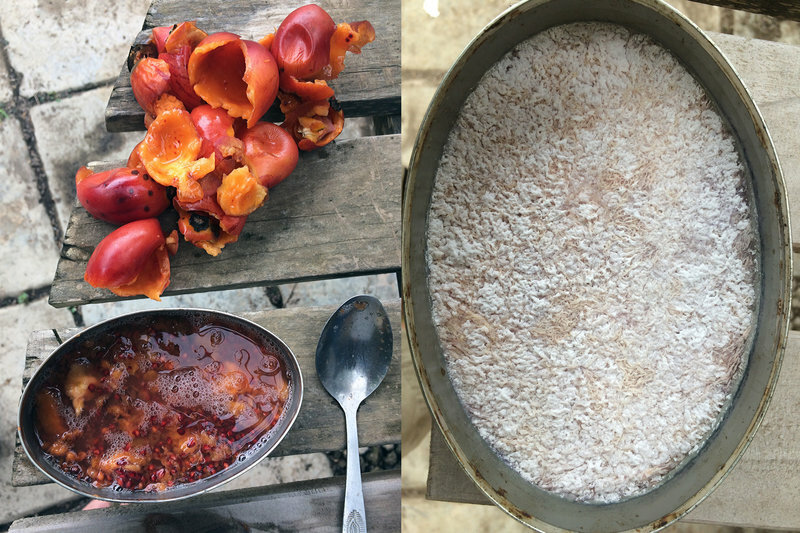 While managing the seed bank at ECHO’s East Africa location, I needed to ferment tree tomato (Solanum betaceum) seeds to harden and preserve the seed coat before cold storage. I removed the skin of the fruits, placed the seeds and pulp into a sterile container, and added enough water so that the container was about half-full (Figure 4). I put a paper towel over the top of the container, to allow oxygen but to prevent entry of airborne fungal spores. Within two to three days, a culture of bacteria (and possibly some fungi) had developed from the natural microorganisms in the tree tomato fruit! To expand the culture, I dissolved 1 cup (237 ml) of sugar in 1 L of water and let the sugar water cool to room temperature. Then, I added the leftovers from fermenting the tomato tree seeds (bacterial culture and liquid) and covered it with a paper towel (you can also use coffee filters). I was curious to see if this culture was similar to Bt, which I knew is commonly found in fresh tomatoes (Rosenquist 2005), which is in the same genus as tree tomato. When a friend told me about caterpillar issues in her maize field, it was the perfect time to try out our culture! I gave her 1 L of the mixture, keeping some back to kick-start the regrowth again, and suggested she dilute it in as much water as she would need to spray her field (which ended up being about 8 gallons of water). Within a day and a half, she said that all of the caterpillars were dead on the plants, and even that some of the pink mold on the ears of corn had gone away! I don't know what species of bacteria I cultured, but it sure did work! I would be encouraged if someone would try to repeat this and test what strains are cultured. How do you know if your culture contains a high-enough concentration of live Bacillus bacteria? For any given substrate, how much does it need to be diluted? What factors (e.g., temperature, pH) affect Bt production? Are there fruits like tomato from which Bt can reliably be cultured? How long can a Bt culture be stored before application? Are there ways to prolong storage life? Can a given technique be scaled up for a village industry, or is it only suited to preparation in a small kitchen? First a few words about the gliricidia tree (Gliricidia sepium; Figure 5). Gliricidia is Latin for "killer." The common name for the tree in Cuba is "mata raton," meaning “rat killer.” This versatile Central American tree is used widely around the world for animal fodder, to shade coffee and cocoa trees (it is sometimes called “mother of cacao”), as a living fence, as a green manure, and for firewood. A natural, easy-to-make rat poison could be a big help to farmers who cannot afford commercial rat poison. A few good-sized pieces of bark are stripped from the tree and boiled in water with about 20 pounds (9 kg) of corn. The corn is then tossed into the fields. Both rats and mice are killed by the treated corn. Reading in EDN that [rat and mouse] poison can be made with gliricidia, but not finding a good recipe, led me to experiment. This is what I came up with and [it] has worked very well for me for over a year now. Take one branch of gliricidia about 5 to 6 feet [1.5 to 1.8 m] long and about 1 to 2 inches [2.5-5 cm] in diameter (it is usually a new shoot less than a year old), cut off the bark with a knife into small pieces (about 1 by 2 inches [2.5 by 5 cm] in size), and mix with about 3 gallons [11 L] of shelled corn in a large pan. Add water to the top of the corn (no more, a little less is better), bring to a boil, and boil for about 10 to 15 minutes. Turn off the heat and let set. The next day I like to pour this into a 5-gallon [19 L] pail (to mix it up a bit) and let it ferment for two or three days. If I don't need to use it all immediately, I dry the extra in the sun to use later. Hoogland’s comments, and more detailed information, can be found in EDN 111. Knowing that coumarin is in both the leaves and bark, could a reliable recipe be made that uses leaves instead of bark? Are there ways to improve the effectiveness of corn or rice as baits? How important is the fermentation step? Perhaps it is needed to support the bacteria needed to convert coumarin to dicoumarol. Can you know for sure if you have a high enough concentration of dicoumarol to be effective? How long can the treated corn be stored, and how? How must it be formulated to make it acceptable to rats and to avoid bait shyness? Is it equally effective with mice? Intestinal parasites are a critical animal health problem. We have heard of various reportedly effective treatments for de-worming livestock. Farmers in various countries use a variety of plants for worm control, including neem (Azadirachta indica), calliandra (Calliandra spp. ), and leucaena (Leucaena leucocephala). Some treatments kill parasitic worms; others have a laxative effect that expels live worms. As in many cases of using plants to treat diseases, detailed, replicable information is lacking (or at least not known to us). If a literature search turns up some promising information, we could perhaps provide plant samples for your laboratory analysis. Ticks can spread disease and are an important concern for livestock farmers, especially for pastoralists whose livelihoods are so closely linked to their animals. Many farmers already know about and use botanical approaches for tick control. In their paper on ethnoveterinary botanicals, Opiro et al. (2010) discuss 13 plant species used in Uganda. More can be done to identify plants with anti-tick properties. What kind of toxins do those plants contain? Are they dangerous for people or animals besides ticks? How can plant-based treatments best be prepared and safely applied? Insect pests in farmers’ fields, left unchecked, can significantly reduce yields or even lead to complete crop failure. Pest problems need to be dealt with in a way that minimizes risks to people and the environment. Integrated Pest Management (IPM) can help; one principle of IPM is to only apply pesticides when needed and in ways that target the pest with minimal effect on natural enemies of crop pests. A farmer needs to know what insects are present, and at what growth stages, in order to deal with an insect problem early enough to avoid crop loss. Perhaps the best way to monitor a field or garden is by routinely walking through it and noting pest species and pressures. However, farmers cannot watch their fields day and night. Also, there may be times of sickness when they are unable to monitor their fields consistently. This is where monitoring traps can be helpful. Once placed in the field, they work 24 hours a day and are easy to check. Placement can be optimized to alert a farmer to the presence of pests at critical development stages. For example, above-ground traps are good for monitoring insects at the winged stage, before they develop into caterpillars that can cause catastrophic damage. An abundance of information exists in the literature, describing designs, colors, and baits that work for various insects. See EDN 136 for information on an insect monitoring trial at ECHO (Figure 6). Much could be done to develop and optimize monitoring traps that work well under constraints faced by farmers in the tropics. These include 1) intense rain—during the rainy season, when most crops are grown—that can render many traps ineffective; 2) limited cash that makes it difficult to purchase commercially-made products such as pheromone traps; and 3) the presence of livestock animals that can ruin traps or that might potentially be harmed. Designs should be made from inexpensive, widely available materials. Tissue culture can be used to help the poor in at least three primary ways: (1) to provide disease-free planting material for farmers, (2) to extend the normal climate range of asexually propagated plants, and (3) to enable transfer of new asexually propagated crops or superior varieties of existing crops between countries without the risk of introducing disease. Dr. Noel Vietmeyer at the National Academy of Sciences told us that some of the "underexploited" Andean tuber crops have been found to produce much better in their native range when grown from virus-free plants produced by tissue culture. Also, they have done surprisingly well at lower elevations where they are not normally grown. These plants produced by tissue culture would be better able to survive in new areas. Also, if only disease-free plants were introduced in an area, they might not acquire the diseases that are endemic in their centers of origin. Cuttings and tubers of vegetatively propagated crops such as yam or cassava cannot be readily and safely sent between countries because of the risk of introducing disease. Tissue cultured, disease-free varieties could make a substantial contribution to local agriculture. Tissue culture techniques could be developed for crops of special interest, to make virus-free plants available. For example, a wide variety of promising tuber crops, grown in the Andean Mountains of South America, would be good candidates. Chaya is another option; we learned that this important perennial vegetable from Central America and Mexico may be a host for a cassava virus. The only way to distribute this plant is by cuttings, because it almost never produces seed. Virus-infected chaya plants could be cleaned up by using tissue culture to grow virus-free plants from meristematic tissue. Another helpful idea is to find or develop simple, low-cost techniques to send tissue cultured plantlets to remote locations, and to grow them into plants that can be set into the field. Some tropical crops contain cyanogenic glycosides, toxic substances that release CN- or hydrocyanic acid (HCN; also referred to as cyanide or prussic acid). Cassava (Manihot esculenta) is one good example. Both roots and leaves of cassava are eaten and both contain cyanogenic compounds. People often refer to "bitter" and "sweet" varieties of cassava, with “bitter” varieties containing the most cyanide. But research has shown that taste is not a reliable indicator of cyanide content. Chaya (Cnidoscolus aconitifolius), a drought-resistant leafy perennial from Central America, also contains cyanogenic glycosides (Figure 7). We consider it one of the most promising plants for introduction into other countries, and describe it in TN 53. If these plants are consumed without processing/cooking, cyanide poisoning can result. The severity of poisoning depends on cyanide levels and how long a person or animal has been eating the plant. Traditional methods to process and detoxify cassava roots include fermentation, prolonged soaking, and boiling. 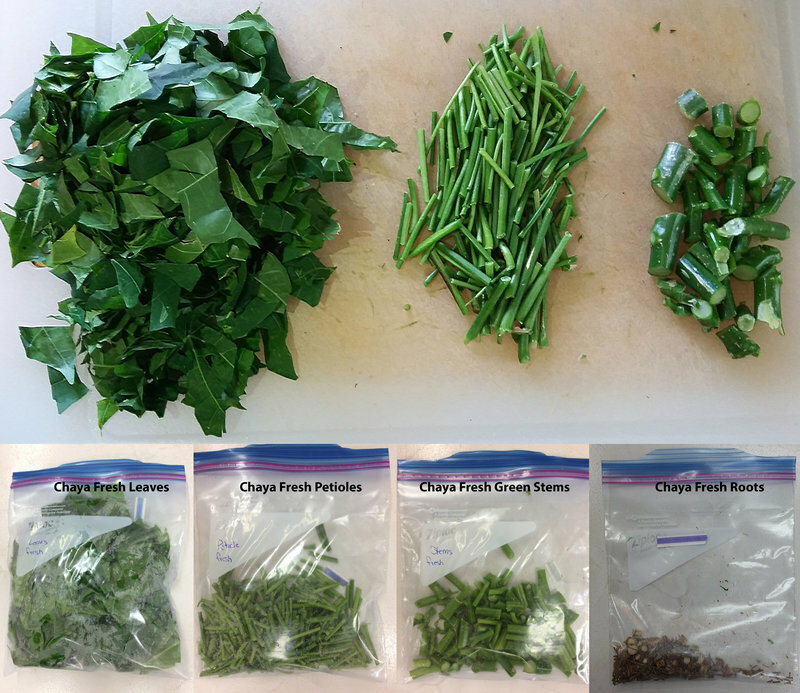 Chaya leaves are typically boiled for at least 15 minutes. The ability to measure CN- would allow people to know if their cooking/processing methods are sufficient to make plant material safe for human and/or livestock consumption. It would also help scientists as they compare varieties or develop new varieties of cyanide-containing plants. In 1995, researchers at the Australian National University in Canberra, Australia, developed protocols/kits using picrate paper to determine cyanide levels in cassava plant parts and products. We are not sure if these kits are still available for purchase. However, it may be possible for university laboratories to replicate protocols summarized in papers such as those by Egan et al. (1998) and Haque and Bradbury (2002). There are also Cyantesmo paper strips that can be used to determine the absence or presence of HCN. See EDN 130 for steps to follow in using Cyantesmo paper. This product detects HCN released as a gas; it will not detect cyanide bound in plant cells. A product called Quantofix Cyanide measures free CN- in solution, but may not detect CN- bound up with other compounds in plant cells. A kit, similar to the picrate-paper approach, could be developed for use by nutritionists, cooks, farmers who buy planting material, plant breeders, and people developing methods to process cyanide-containing plants into animal feed. If you know of a laboratory that tests for cyanide and that would accept plant samples from other countries, please let us know. ECHO could play a role in letting development workers know of such resources. If you choose to investigate cyanide-containing plants, we may be able to send samples of several cassava varieties and types of chaya. Capalbo, D.M. 1995. Bacillus thuringiensis: fermentation process and risk assessment. A short review. Memórias do Instituto Oswaldo Cruz 90(1):135-138. Egan, S.V., H.H. Yeoh, and J.H. Bradbury. 1998. Simple Picrate Paper Kit for Determination of the Cyanogenic Potential of Cassava Flour. Journal of the Science of Food and Agriculture 76:39-48. Gupta, A., S.N. Sinha and S.S. Atwal. 2014. Modified Atmosphere Technology in Seed Health Management: Laboratory and Field Assay of Carbon Dioxide Against Storage Fungi in Paddy. Plant Pathology Journal 13:193-199. Haque, M.R. and J.H. Bradbury. 2002. Total cyanide determination of plants and foods using the picrate and acid hydrolysis methods. Food Chemistry 77(2002):1007-117. Hockman, H. 1966. Mechanism of Rodenticidal Activity of Gliricidia sepium. Defense Technical Information Center. Jaleta, T. 2013. Effect of feeding Leucaena pallida with concentrate and antihelmentic treatment on growth performance and nematode parasite infestation of Horrow ewe lambs in Ethiopia. International Journal of Livestock Production 4(10):155-160. Luna-Finkler, C.L. and L. Finkler. 2012. Bacillus sphaericus and Bacillus thuringiensis to Insect Control: Process Development of Small Scale Production to Pilot-Plant-Fermenters. Insecticides - Advances in Integrated Pest Management, Dr. Farzana Perveen (Ed. ), ISBN: 978-953-307-780-2, InTech. Mohan, S. and M. Gopalan. 1992. A study on the use of biogas from cowdung for storage insect control. Bioresource Technology 39(3):229-232. Navarro, S. 2006. Modified Atmospheres for the Control of Stored Product Insects and Mites. Chapter 11 in: Insect Management for Food Storage and Processing. Second Edition. J.W. Heaps, Ed. AACC International, St. Paul USA. Navarro, S., B. Timlick, C.J. Demianyk, and N.D.G. White. 2012. Controlled or Modified Atmospheres. Chapter 16 in: Stored Product Protection. D.W. Hagstrum, T.W. Phillips, and G. Cuperus, Eds. Kansas State Research and Extension. Opiro, R., A.M. Akol, and J.Okello-Onen. 2010. Ethnoveterinary Botanicals Used for Tick Control in the Acholi Subregion of Uganda. Journal of Animal and Veterinary Advances 9(23):2951-2954. Rosenquist, H., L. Smidt, S.R. Andersen, G.B. Jensen, and A. Wilcks. 2005. Occurrence and significance of Bacillus cereus and Bacillus thuringiensis in ready-to-eat food. FEMS (Federation of European Microbiological Societies) Microbiology Letters 250(1):129-136. Sallam, M.N. 1999. Insect Damage: Post-harvest Operations. INPhO—Post-Harvest Compendium, FAO. Sani, R.A., G.D Gray, and R.L. Baker. 2004. Worm Control for Small Ruminants in Tropical Asia. Monograph Series, Australian Centre for International Agricultural Research. Subramanya, S., D.G. Prabhanjan, C.K. Babu, M.V. Ramakumar, C. Krishnappa, K.C. Krishnamurthy, G.S.V. Raghavan. 1994. Biogas as a grain protectant against Callosobruchus chinensis (Bruchidae, coleoptera). Journal of Food Processing and Preservation 18(3):217-227.